Far Cry 5 has exceeded every expectation I had for it, but has also shaken up the formula that I’ve grown accustomed to within the series. It is equal parts Far Cry (3 / 4 / Primal), Ghost Recon: Wildlands, Bioshock: Infinite, and State of Decay (if you can believe that); my playtime with it has felt like a remarkable breath of fresh air from a series that hadn’t yet grown stale. Author’s Note: I’ve marked this review spoiler-free in that I’ve sought to mitigate all but the earliest details within the story of Far Cry 5. Minor allowances and insights to the plot are given simply to set the stage of the world that Ubisoft has presented within the fictitious Hope County, Montana. 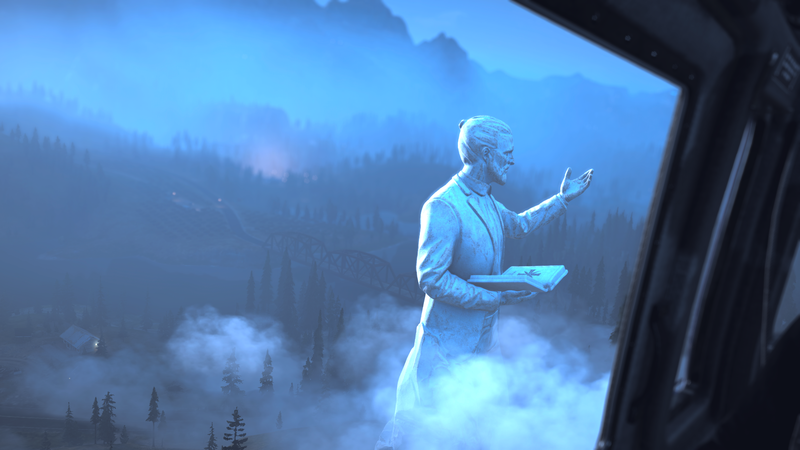 The game picks up as you enter Hope Country, Montana – (presumably) the first time the series has seen North American soil – looking to apprehend ‘The Father’, Joseph Seed, leader of The Project at Eden’s Gate cult. As an unnamed Deputy making your way through his compound, the first glimpse at PEG’s fanaticism makes itself apparent; members of the cult jeer, taunt, and make sure to let you know that – in no uncertain terms – you are not welcome upon the ground you tread. A few scripted / limited-engagement minutes later (and an up-close display of the latest in digital man-bun technology), proverbial hell breaks loose and The Father announces the commencement of ‘The Reaping’, a signal of the end-times to come as prophesied by the cult’s leader. Driven to escape the members of PEG (frequently referred to a ‘peggies’ by those outside the cult’s community), you take flight into the darkened woods in the quest for save haven. The introduction very cleverly / subtly funnels you into a few action points within the open-world; so subtly, in fact, that I was quite surprised with myself that I arrived at the intended destination without feeling as though I’d been specifically guided there. Perhaps I was too preoccupied taking in the beautifully-crafted world (more on that in a moment), or I may have been leaning too heavily into the frantic pace and feeling of being pursued; one way or another the guide rails did not make themselves apparent from the onset – a rare treat for scripted introductory sequences. Far Cry 5‘s opening hour is informally broken into three distinct pieces: Introduction (noted above), a brief ‘tutorial’ on how the game’s open world functions, and then the remainder of the game that may be tackled however you please. The tutorial segment, for lack of a specified term, tasks you with creating your character with a very basic creator system before handling a few of the game’s open-world activities and side missions to get an idea of how to begin taking the county back from PEG forces. Once you’ve slapped on one of eight faces and gathered the lay of the land, your newfound cohort explains the county’s breakdown and what to expect when adventuring about. It’s in these early moments that you learn that the entire county is without cellular service, which is the biggest leap-of-faith that the game requests of you to deliver an immersive experience. An entire county without cell service in the US and the telecom providers haven’t rectified the blackout area? Unlikely, but necessary for the remainder of the story to succeed. The third segment is when Far Cry 5 sets you free; the main story is progressed through damages done to PEG’s stranglehold on the county, and you are left to your own devices to dismantle the Seeds’ regime, a la Ghost Recon Wildlands. Those familiar with GRW will undoubtedly draw some similarities between the two titles (developed in different Ubisoft studios, to be clear), as there are three distinct regions within Hope County; each is lorded over by a different member of the cult, and each of the three focus on expanding PEG’s dominion over the land in different ways. Taking the fight to cultists within those regions increase your Resistance meter, which quantifies just how much ‘hurt’ you’re putting to the bosses of the region. Armed with that information, the game turns you loose into the mountainous wilds of Montana with the primary goal of bringing down Joseph Seed – the head of the snake. As I’d mentioned earlier, the first few minutes of running through Far Cry 5‘s wilderness was a breathtaking experience. Playing this on the Xbox One X in 4K/UHD is an absolute treat. It feels as though you can count the needles on the trees, and see every blade of grass rustling in the wind. Sunsets and sunrises steal the show when silhouetting set pieces and creating a dazzling glare that doesn’t rely upon the now-cliché lens flare effect from days gone by. Most of my game captures and screenshots (by a significant measure) are of environment-centric set pieces that’ve stolen my breath away. As a console-only gamer that’s relatively new to the wonder of 4K rendering, I’m entirely comfortable in the claim that Far Cry 5 is probably the most visually-striking open-world game I’ve come across to date. Now, it’s not uncommon for developers of open-world games to boast that they’ve created the ‘biggest map to date’ within a series, but a problem often seen in light of those claims is when the physical space is sparsely packed with substantive things to work through and engage in. Far Cry 5 does not suffer from that problem – it feels like there’s just about always something going on in the vicinity, though it might be a short jaunt away. It’s in that living, breathing world creation that some of the game’s best presentation pieces actualize themselves. Take, for example, an encounter I had in the first few hours of gameplay. I’d stumbled across some given farmland and cleared out the PEG members that had made themselves at home. Feeling content in my deed, I began heading off (on foot) to the next point of interest. It wasn’t more than a few moments later that I stopped to take in the scenery again, with the sun setting behind some trees and casting a lovely golden colour over the farmer’s field of knee-high, grassy, crop growth blowing gently in the wind. Is it straw? Hay? Something else? I’m not sure – I’m not a farmer. With the split-wooden fence in the background, bales stacked and strewn about near a mid-size shed, and a small tractor sitting at the ready, something reminded me of farmlands near my childhood home and how peaceful and serene the landscape could make one feel. But then Far Cry happened. 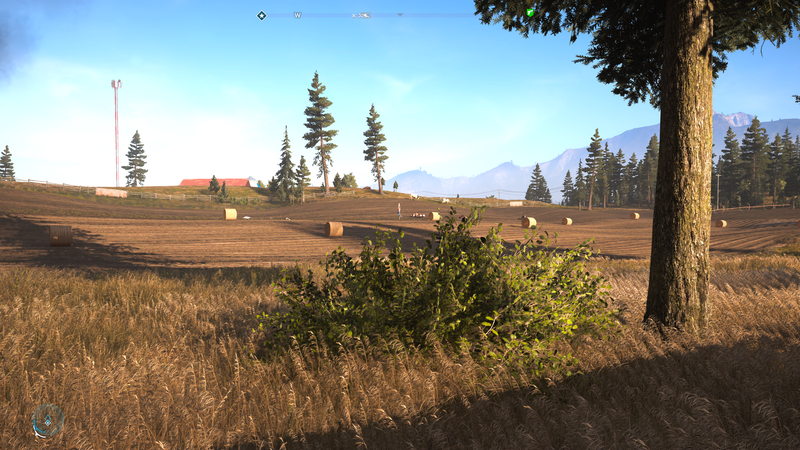 It was a raucous clash over the next hill that shook me from my awe-inspired stupor, and I started a casual jog to investigate; what I found was quite reminiscent of previous Far Cry titles that help form the dynamic world, loaded with emergent gameplay. Roaming members of PEG had encountered militia forces of the Resistance and had squared off with one another, automatic weapons running wide-open. A trademarked ‘heavy’ soldier (armoured, and boasting a sizeable LMG) was driving the skirmish into the favour of the PEG cultists. As he lumbered closer to the remaining pair of Resistance troops, one of the other cultists did just enough damage to the Resistance ATV, causing small craft to detonate, summarily killing everyone in the tight-quarter battle save for him and another nearby ally of his. The engagement drew to a close (with me still jogging across the farm field, observing the encounter). The NPCs relaxed, even meandering a few steps this way and that as they seemingly shook off the combat adrenaline. But then Far Cry happened – again. A sizeable brown bear burst out of the nearby shrubbery on the other side of the road and lunged for the hapless cultists, knocking one to the ground. The bear took hold with its powerful jaws and began shaking the poor fool about; dropping him to the ground, quite dead. The second member of PEG took flight, away from the bear, and off down the road to some presumed safety. The bear began its pursuit, and caught up relatively quickly to do away with its second victim is just as many moments. The second cultist dispatched (and me now keeping my distance with a recently diminished ammo stockpile), the bear lumbered back off down into the brush and up over the gentle embankment. Emergent gameplay (the often-unpredicable encounter of several unscripted game systems) is one of my favourite things to document and recall in open-world games like this, and this example was anything but disappointing. Though the above is a one-off example of a seemingly limitless world of AI systems clashing with one another, it helps fill in the blanks left open by the developing team. Where I’d mentioned that the world was often full of meaningful activities to engage in, this is the kind of unpredictability that one can find in Far Cry 5. Each time you happen across a roaming patrol of PEG members, take out their supplies, rescue their hostages, or more – the oppressive cult feels the sting and dedicates more resources towards strengthening their grasp upon the members of the county. What exactly that entails, however, I’ll leave for you to discover; this is a spoiler-free review, after all. Where better to talk about combat elements than after the tale of a cultist-hating brown bear’s murder binge? 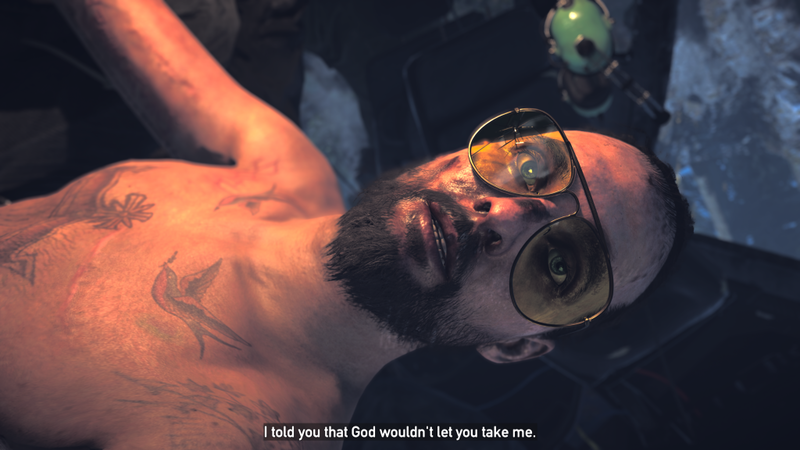 Death comes in all forms to many people within Far Cry 5‘s impressive cast of NPCs, and some proper pre-planning can help turn the tide of battle in your favour. The series’ buttery-smooth shooting mechanics make a prominent return to the game (although the input response levels may need tweaking to those coming off some twitchier shooters like CoD WWII), and the world is well-populated with instruments of destruction awaiting your command. As with previous games’ limit of four weapons, you’re able to carry a sidearm and primary weapon to start and can expect additional weapon slots unlock a little later through the progression system. Unlocked separately from skills and abilities are the weapons for sale at the various shops, which come at regular intervals as you build overall Resistance levels against PEG’s leadership within the three regions of Hope Country. Weapons can be customized at any of the stores where you may purchase them, and just about all of the early-game weapons I unlocked for purchase had a number of attachments to select from: scopes, suppressors, extended magazines, and more. ‘Prestige’ versions of weapons are also available for purchase at exceedingly-higher costs, but at first glance seem to be a fancy skin for the weapon, not one with increased performance. 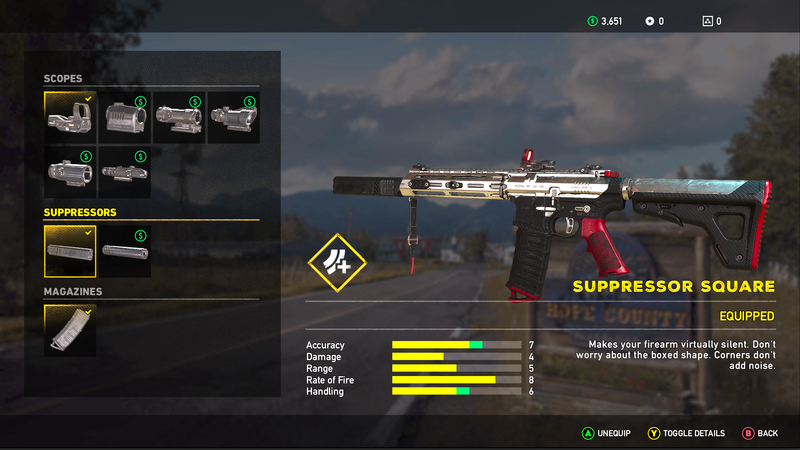 The latter observation had me breathe a sigh of relief, as it would appear that Far Cry 5 will include the option to purchase ‘silver bars’ as a microtransaction to unlock these weapons ahead of schedule. (Note: The in-game store has not been activated at the time of this writing; it is likely we’ll need to wait until public launch to see exactly what those purchases entail.) Small arms aside, there are still loads of ways to deliver your PEG enemies to death’s doorstep. Not coincidentally, as expected at the tail end of my feature on Dynamic Fire in Far Cry 2, dynamic fire propagation has made its return to the series in grand fashion. One nice addition that’s worth noting is the Guns for Hire that have been advertised since the first trailer was released. 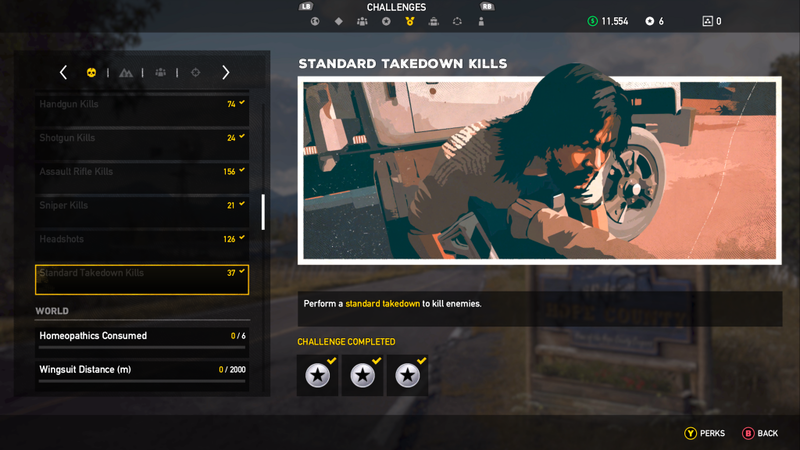 Some are unlocked from the get-go through story missions, some are encountered along your travels, but all of them are deadly partners that can be brought along for the high-octane ride that forms most of the combat engagements within Far Cry 5. 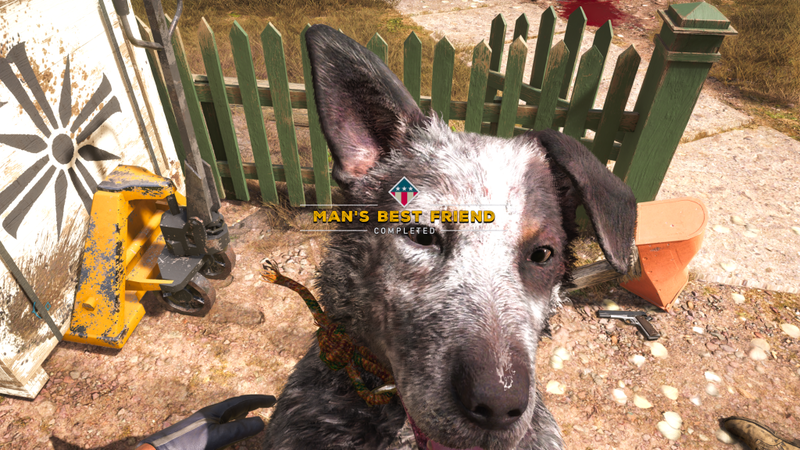 Of those that are permanently unlocked and added to your roster through mission progression, you can select from a handful of loyal animal companions to dog you or a wider array of humans that all bear their own skills. Fighting’s a peach when you don’t have to go it alone. These challenges, which are fairly run-of-the-mill, amount to a healthy handful of skill points for every hour of play, but form a bit of a double-edged sword. If you stick to a given playstyle and rarely venture outside personally-established conventions, your skill point rewards will slow down as you complete these non-repeatable challenges. On the other hand, paying attention to your challenge progress may push you out of a comfort zone and into something that you don’t particularly enjoy, simply in pursuit of skill points to increase your character’s overall capabilities. I’d recommend toeing the line between a comfort zone and foreign territory, simply so that you have some reliable tool(s) at your disposal all the time (mine is the assault rifle), but continue building out your character with tools of the road less traveled (for me, the shotgun). Far Cry is all about experimentation – take it at your leisure. Now, the skills that the points serve to unlock form a basic skill tree with fifty total skills to unlock. They’re grouped into five categories, and some will require that a predecessor be purchased before you may unlock the one that follows it. Nothing here breaks the mold, though the freedom to unlock what you want is a welcome bit of polish, instead of other games that force you to into bottlenecks within skill trees. Most of the skills feel relatively small unto themselves (at first), but just as with any other progression-based game the skills you acquire (and greater proficiency you reach with them) will snowball into a highly-capable character able to take on everything that the world has to throw at them. It’s a rewarding practice that’s implemented well and rewards those who embrace the ‘variety is the spice of life’ mantra. It’s been many years since a Far Cry game was rooted in linear, sequential action scenes, and this latest release proves no different. There are (literally) hundreds of side missions and activities to undertake across the regions within Hope County – some more impactful than others, such as series-standard Outpost clearing. A personal favourite of mine has proven to be the Prepper Stashes; mini-puzzles that task the player with a quick investigation in pursuit of some gear. Early on in the game you’re introduced to these bite-sized missions and find yourself looking for someone’s supply stash that’s been lost in a flooded storeroom underground. The premise is simple enough – find the pump to do away with the water, right? The pump, however, is locked in a room that requires a key, so you’re on the hunt for that one next. What if the key is locked behind yet another door that doesn’t have a key? Scour the environment for a way in, and your efforts will be rewarded as you work backwards through those steps to get into the stash. 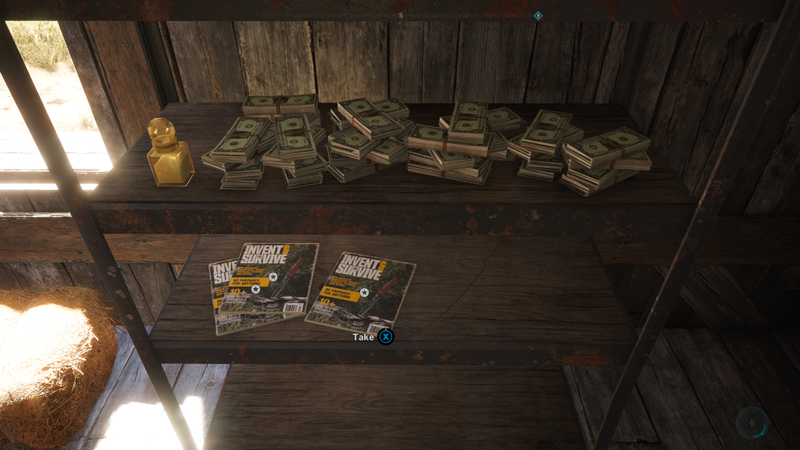 Each Prepper stash contains some money that the player can pilfer and/or some ammo and useable equipment, but the real reward, however, is a few Skill points found in the way of survivalist magazines laying about. They add up over time, and consider that each Prepper Stash rarely takes more than a few minutes to trace through, it’s well worth the time spent. Prepper Stashes aside, Hope County is full of things to keep you busy and entertained, and not all of them feel as heavy-handed as taking the fight directly to the cult. Some involve helping the locals (ie: scaring cows back into a pen or doing away with a local bear threat), some involve seeking out glory in high-octane vehicle races, and some of the best stuff is entirely unmarked or rewarding beyond the gameplay experience itself. You can go fishing or hunting in the back-country or bodies of water, take a gentle hike through the stunning environments, or chase down cultists on the road that may be carrying supplies, prisoners, or little more than a bad attitude and some firearms. 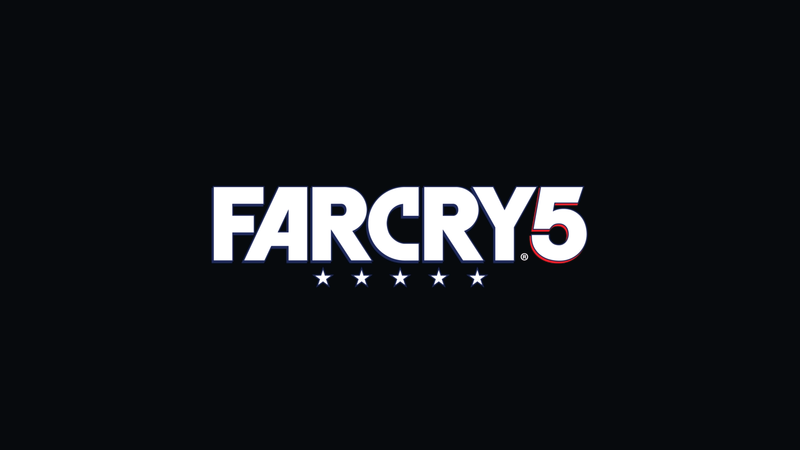 Some of the recent Far Cry 5 promotional material touts the game as an outrageous sandbox / co-op experience, complete with the next generation of the series’ already-excellent map editor (dubbed Far Cry Arcade). Some of these options were intentionally left disabled ahead of launch (and as such are absent from this prerelease review), and I have not experience them first-hand. If, however, history repeats itself and Far Cry‘s ever-impressive map builder continues to elevate itself compared to prior releases, it will truly be a spectacle to behold for all of those that enjoy homebrewed maps and game modes. 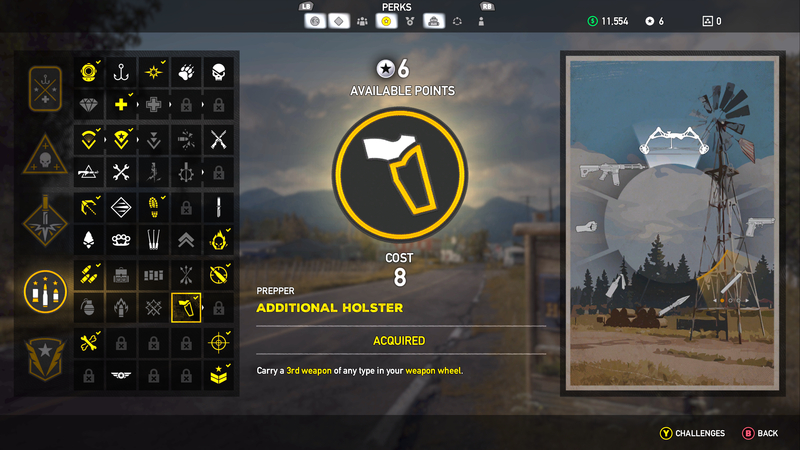 Now that many assets from other Ubisoft titles (such as Assassin’s Creed and Watch Dogs are being packaged for inclusion in Far Cry Arcade, the possibilities for community-generated hijinks seem endless. 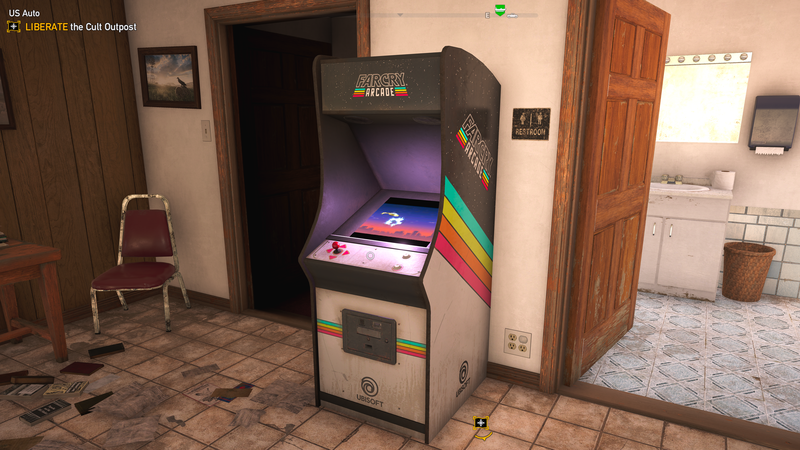 Moreover, arcade machines and posters are scattered across all of Hope Country, prepared for a seamless transition into one game mode or another. Co-operative / multiplayer gameplay is also heavily promoted within the game’s menu system – many of my friends have talked (for months) about their enthusiasm towards trying out the entire game in co-op. As the only member of my gaming circle to have prerelease access to the title, co-op is something I’ve yet to put any time into. That all said, if it’s drop-in-drop-out multiplayer akin to other games (such as Ghost Recon Wildlands or Dying Light), I expect that it will be a blast. You are fighting against a fanatical cult claiming to execute the Will of God, and their leader preaches almost exclusively from the Book of Revelations. As a result, the game is heavily draped in religious overtones that intentionally bastardize the (presumed) original intent of Christian Scripture. 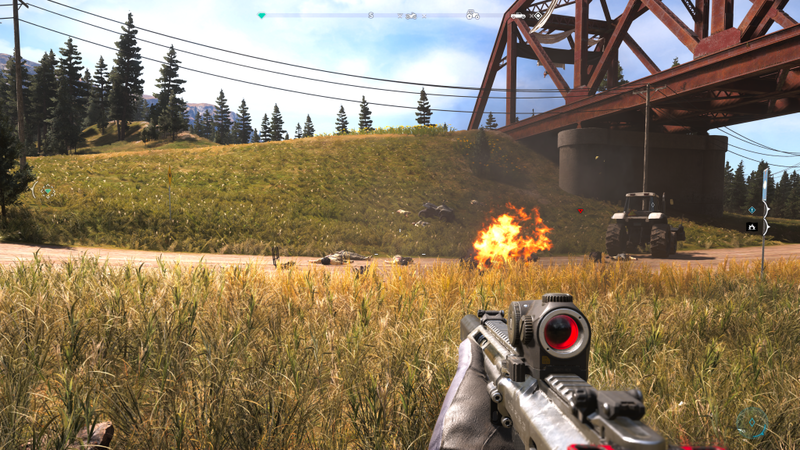 Another note of comparison between Far Cry 5 and Ghost Recon Wildlands is that the world is your stage, and the scene is set up at the beginning quite similarly between the two titles. In both you’re hot-dropped into the thick of the action and tasked with taking down the region’s oppressors however you’d like, and in whichever order suits your preference. It’s a true sandbox that Ubisoft has crafted once again, and the overarching story unfolds at the pace you’ve determined for it. With all of that out in the open, however, the tone between the two games couldn’t be more different. In GRW, your enemies realize that their actions are borne of ill will, and they revel in it; in Far Cry, the PEG forces believe that their actions are a byproduct of the prophesied Word of God and that this is the *only* just action that they could follow. It’s an intriguing read into Ubisoft’s portrayal of a Doomsday cult, one way or another. I opened this review with the up-front commentary that Far Cry 5 exceeded every expectation that I held before loading it up for the first time. From the first moments running through the woods to mounting an effective militia against those who would seek to usher in the End Times, I encountered very few bugs or detracting gameplay issues, and found the various contents and systems within the game to refine virtually everything that was presented in Far Cry 4, a game I’ve long held in high regard as well. 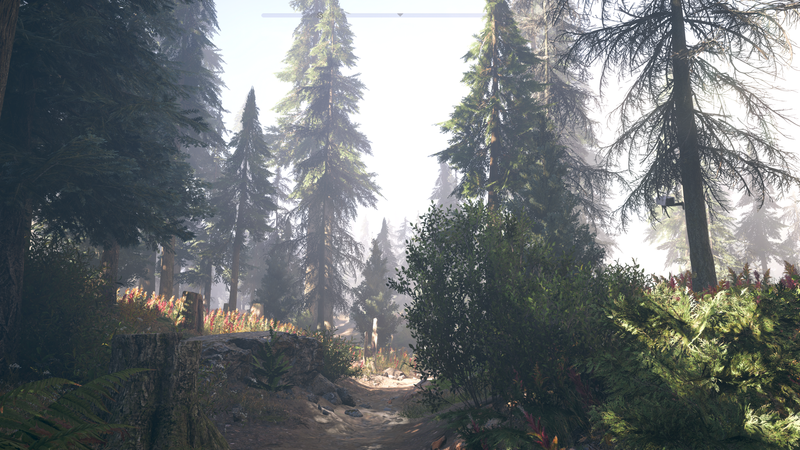 Though there isn’t much to compare directly against Far Cry Primal, the technical predecessor to this latest release, environmental upgrades and engine tweaks feel readily apparent (though, admittedly, this may just be a result of the Xbox One X Enhancement). The smallest details blend together to create one of the most immersive landscapes I’ve encountered yet, and speaking from someone who lives due north of the game’s fictitious locale, I can affirm that very much of what’s presented feels pulled straight from reality. Another point I should’ve disclosed much earlier is that I sought to do as much damage as possible within only one of the three regions’ leadership. I haven’t even stepped foot into the other two, and I’ve got about 15-20 hours of gameplay under my belt. There’s an astounding amount of side content to tackle alone, with friends, or with the surprisingly competent AI partners you may assign to your personal troupe. 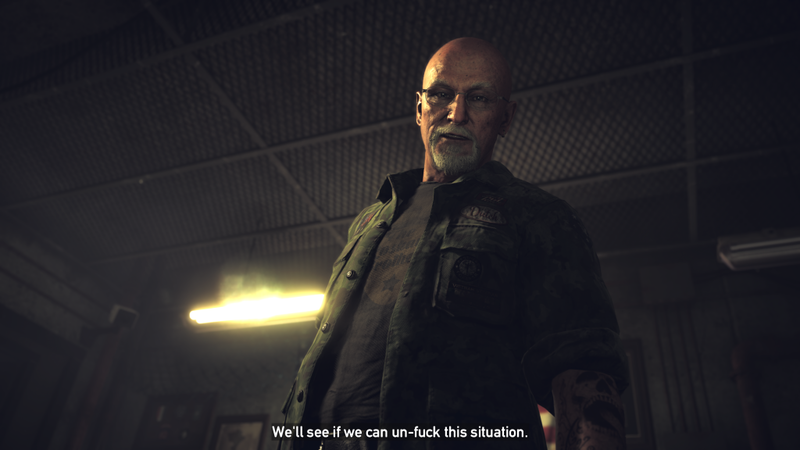 I, for one, cannot wait to make my way through the remainder of the game’s offerings if what’s been presented so far is anything to use as a foundational basis for my experience within Hope County. Closing Note: As this has been a spoiler-free review, if there are systems or elements within the game you’d like to know more about, please leave us a message in the comments below or @MarkusRising on Twitter. I will continue to explore the deepest facets of the game in future writings once it’s more fair to enter Spoiler Territory. Far Cry 5 does its predecessors the courtesy of succeeding them without putting them to shame. Everything that the series was built on has been refined, expanded, or silently shuttered and left by the wayside in favour of the logical next step forward. A true success in every facet.